The Details: Good field of about 60-65 guys including a few DLP pros, Johnny Sundt (Kelly Benefits), and about 12 Coca-Cola Hincapie riders. I worked hard to stay near the front for the first half of the race. I started to cramp up in my calves right about the halfway point of the 50kilometer (31 miles) race so I drifted backwards towards the back of what was left of the field and tried to recover. There were lots and lot of small moves and splits in the field, but nothing was staying away. With 10 laps to go though, a split of about 10 riders got up the road with good team representation. I attacked and bridged up to it and we stayed away for two to three laps. I thought for sure the winning move would be a break from that split so I watched for an opportunity but nobody attacked and the field caught back up to us. At this point it was all back together and the pace ramped up as people fought for position. I kept good position, but not quite as good as I would like. I came around the last corner in about 10th place, passed a few people and then got passed by one or two as I cramped up bad before the line. All-in-all 9th place isn’t bad especially with cramps off and on for about half the race. 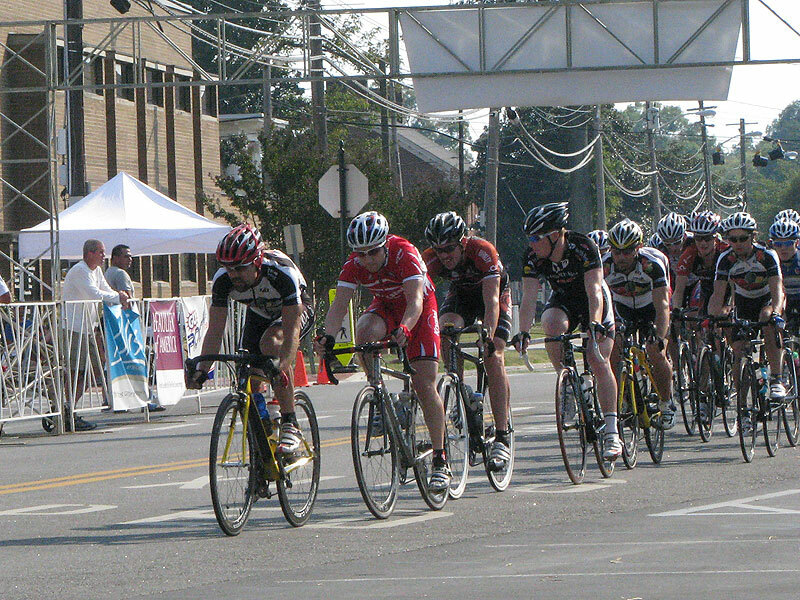 My teammate, Mike Lackey, had a good race in the Cat 3 field – working hard to stay near the front, cover moves. He ended up taking 8th place in his race with one guy soloing off the front to win. Tomorrow we race together in a combined P/1/2/3 field and I am looking forward to it. Another day, another race! I bridged up to the end of this late race break. We stayed away for a couple laps. 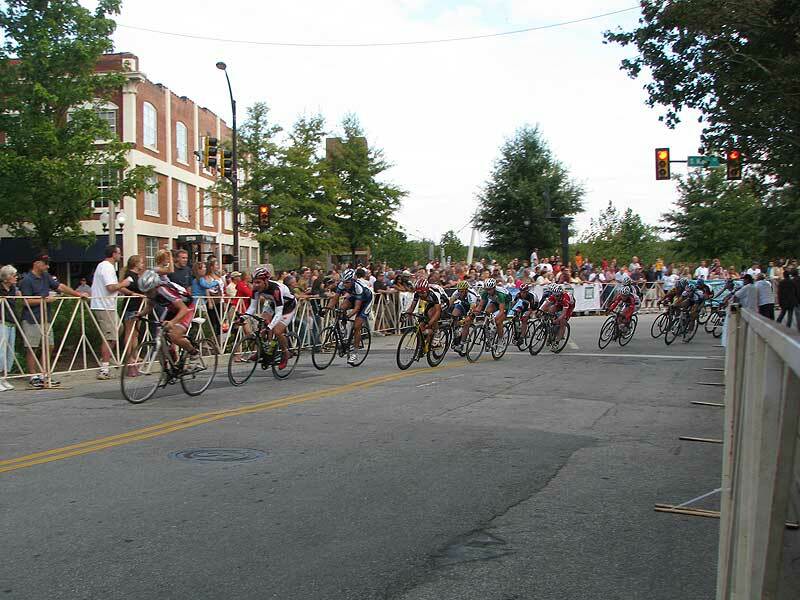 This entry was posted in Racing and tagged bridge, criterium, photos on October 11, 2008 by kartoone. 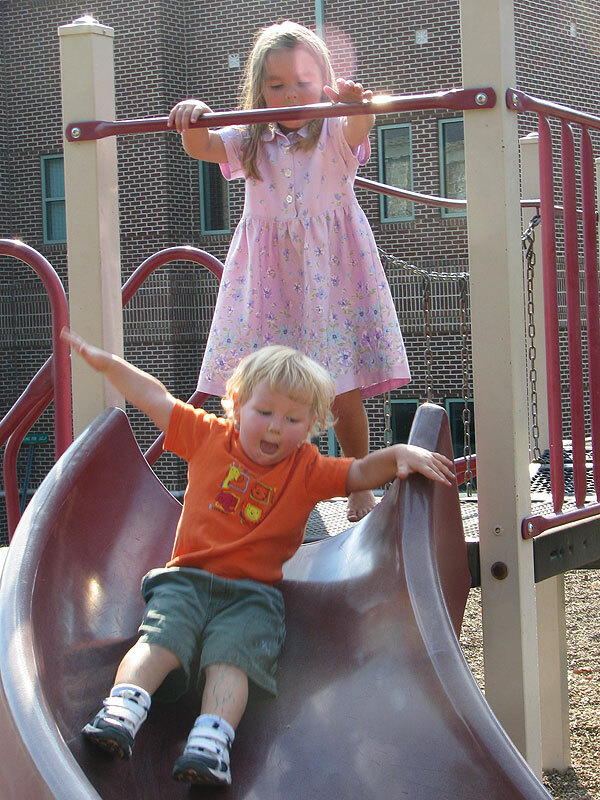 Josiah and Analise had fun too on the playground right next to the course and the free bounce-house before the race! Summary: Excellent team race, 4th (me), 14th (Mike), and a great leadout (Stuart). Good practice for a variety of situations that can come up in a race. The Details: Stuart, Mike and I lined up in a small field – three riders from Hincapie Development (AJ Meyer, Ben Gabardi?, and Steve Carpenter), two riders from Team Type One masters (orange and white kits), one rider from Team Type One (Phil Southerland), two riders from Myogenesis (Eric Murphy and Cleve Blackwell), John Murphy (Healthnet), and about 10 other riders to make a total field size of 22. They combined the P/1/2 and the Cat 3 fields so they shortened our race from 60 minutes to 40 minutes. 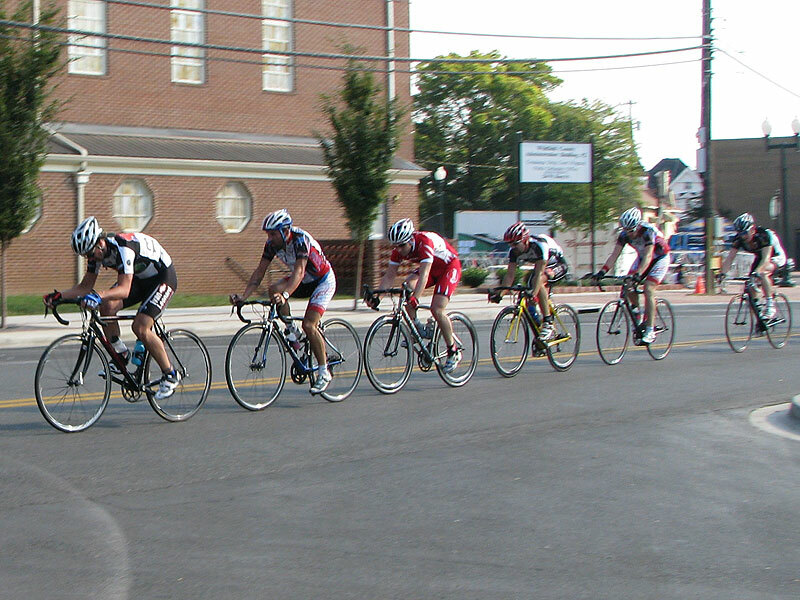 I got the hole shot into the first corner and wound up leading the field for the first couple laps at about 20-22mph waiting for an attack. It wasn’t coming so I attacked before turn 1 at the beginning of lap 3 when they called a prime for the next lap. Stuart countered my move to move into position for the prime, but John Murphy attached himself to his wheel. I was feeling really good and thought that I could sneak onto Murphy’s wheel and take the prime, but he was too fast and that left the three of us just off the front with Murphy a little ahead of Stuart and I. It looked like Murphy was going to sit up so Stuart and I sat up and let the front of the group catch up to us for someone to take up the chase. 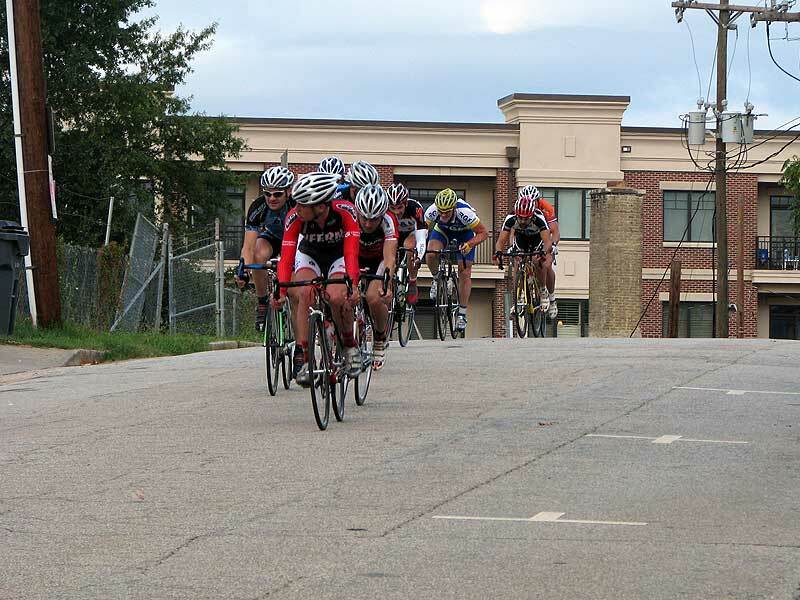 There was a strong attack from a Hincapie Development rider who quickly bridged to Murphy. It looked dangerous so I attacked and made a short bridge onto them before the end of Lap 4. 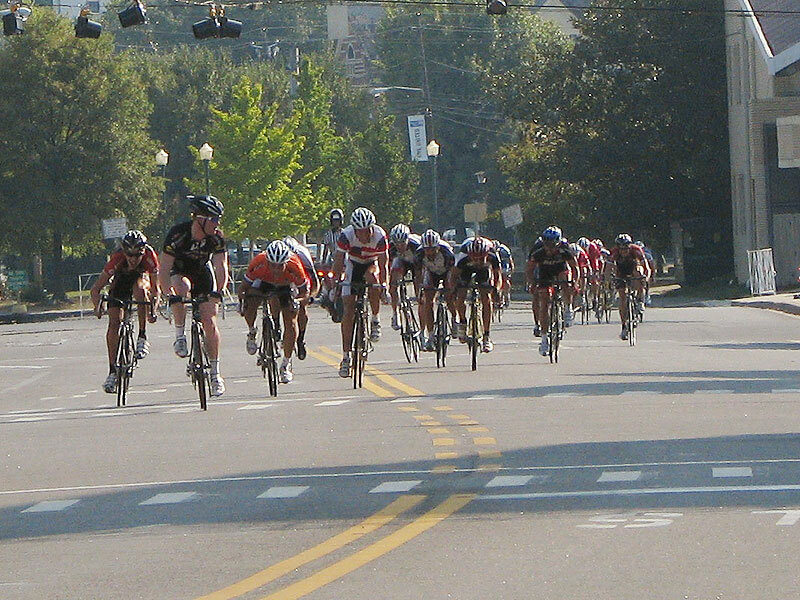 By this time, there was a split in the group that left seven of us up front in the break – me, John Murphy, Cleve from Myogenesis, Steve Carpenter and AJ from Hincapie Development, David McNeal, and Steve from Team Type One development. Our break was not a happy family with several attacks from Hincapie, from Murphy, from Myogenesis. When we were getting close to lapping the field, Murphy attacked and got away by himself being the first to make the bridge. I waited until the rest of us made it up to the field and then attacked to go off the front of the field. But at this point, there was enough fresh legs to keep everything together (including pulling back Murphy) to the end. That’s what happened – a field sprint, but there was some excellent teamwork leading up to it. Mike and Stuart both moved to the front of the field once we all came back together. Mike put in a few attacks which was great, because some of the people who were in the break with me ended up chasing them down causing them to get tired. Perfect. Stuart also got to the front and drilled the pace for several laps to discourage any attacks, which gave me a chance to rest at the front of the group without worrying if any of my breakaway companions were going to attack. Then at the very end, Stuart ramped the pace way up to discourage any last lap attacks. I slotted into the top 5 going into the last two turns, but I chose the wrong wheel and the rider I was on sat up coming out of the last corner and I had to chase around but I couldn’t catch the top 3 and I ended up 4th. Mike sprinted well to finish 14th and Stuart had already set up the perfect leadout but I got a little bit unlucky sitting on the wrong wheel for the sprint. Ok, so that was it. Good result, EXCELLENT practice for next week. 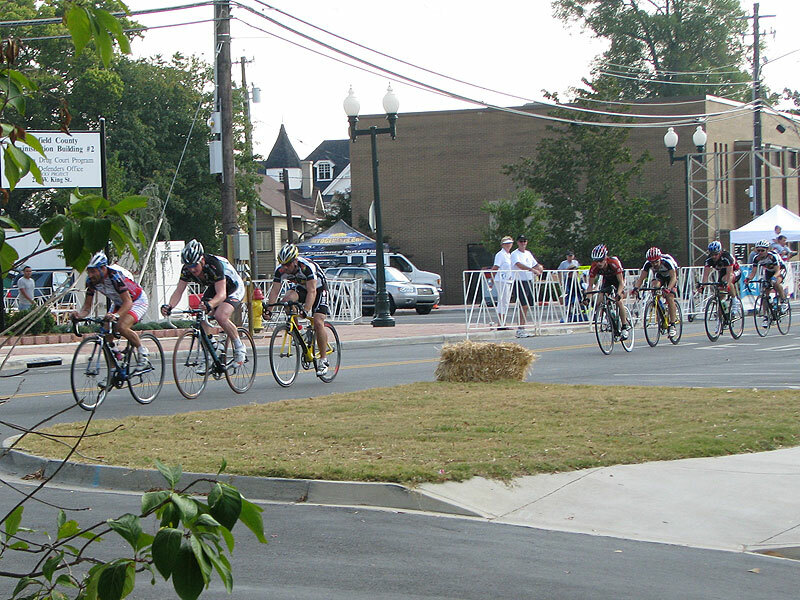 This entry was posted in Racing and tagged bridge, criterium, heartrate, photos, power on October 6, 2008 by kartoone.